Pano2VR will help you convert spherical or cylindrical panoramic images into QuickTime VR (QTVR) or Adobe Flash 8 and Flash 9 & 10 formats with features such as hotspots, customizable skins and directional sound. Pano2VR will provide users with features such as customizable skins, multiresolution (gigapixel panoramas), hotspots and directional sound. - Pano2VR supports cylindrical, spherical (equirectangular), cube faces, cross, T, strip and QuickTime VR as input formats with the added ability to convert between these formats for retouching the cube faces. Supported file formats are JPEG, PNG, TIFF (8, 16 or 32 bits per channel), OpenEXR, Radiance HDR, and QuickTime VR files encoded with JPEG. - Pano2VR allows you to patch the input image dynamically. 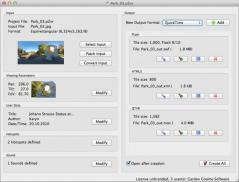 You can select an area of your panorama and export it to your image editing software. - The Patch Tool supports alpha channels so only those areas that need to be fixed are remapped and the rest of the image is not touched. - The patch tool can also apply mirror ball or spherical caps on the areas you want to hide. You can watch the patch tool tutorial to see it in action. - The Skin Editor allows you to design your own look and feel for your panorama player. You can add your own buttons and graphics, design hotspots and build maps for your tour. - You can also add animations and sound effects to your skin to help the user interact with your panoramic images. - If you would rather not design your own skin you can use one of the skins that comes with Pano2VR, download skins from third parties or from the user designed skins forum. - With the Sound Editor you can add various sounds to your panorama. You can add a simple background sound or define directional sound sources within the 3D space. - You can choose between different sound field shapes, change the size of the direct and indirect sound field and select a maximum and ambient level to design your own soundscape. - Pano2VR exports the panorama including all graphical elements as a single SWF file in the Flash 8 or Flash 9 & 10 format. This allows greater control over the download behavior and makes it easier to distribute the panorama to clients, add it to content management systems or post it on a blog. - Cylindrical as well as cubical panoramas can rotate automatically with selectable direction, speed and delay. Panoramas can contain hotspots as well as a pre-defined or fully customizable skins. The integrated skin editor also allows you to add maps, links, logos and other information to the panorama in a user-friendly way. - Pano2VR can export cylindrical and cubical QuickTime VR panoramas with subtiling for progressive download, autorotation with selectable direction, speed and delay, userdata, protection flag, and a preview track.